Designed for therapy on your neck, shoulders, back and feet. Dimensions:6½ Feet x 7 feet. Includes: Two (2) therapy pumps, and a 24 hour circulation pump for water management, a brand new cover (valued @ $500), and a 90-day warranty. 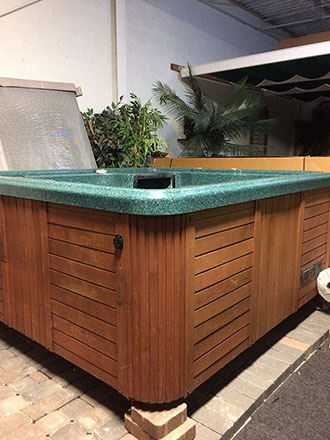 This is a beautifully refurbished hot tub, completely inspected by spa technicians. (original retail price: $15,900). We here at Recreation Warehouse & Flooring Center have been servicing the northeast Ohio area for over 25 years. Our core crew itself has over 100 years of experience! We offer a full selection of carpeting, hardwood floors, laminate flooring, porcelain & ceramic tile, sheet vinyl and luxury vinyl tiles. For our clients convenience, we added kitchen and bath cabinets as well as a large selection of countertops to our categories. In our showroom you can view your options and go over designs for your home improvement project. We always offer professional installation or you can purchase the materials only. All of our flooring products are manufactured with latest "green" technology and are "Floor Score" certified (that means they're healthy for you and your family. Unlike suspiciously cheap liquidation stores). In our pool and spa department you can choose from a vast array of above ground pools in various sizes and you can speak with one of our professionals about your options in our in-ground pool lines. 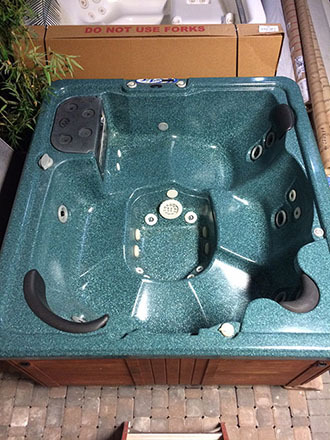 In the spa and hot tubs category, we offer newly refurbished models from various manufacturers, giving us the ability to fit any budget. New and refurbished models arrive once a month on average - so stop in today. We offer delivery and professional installation. We have access to a large number of pool manufacturers and will guide you through the fairly complicated project of pool /spa installing. Unlike many other warehouses, we can install small and big. We also sell and install enclosures, awnings, pool encapsulating patios and spas of all sizes! Voucher must be mentioned when redeeming. Delivery charge and set-up not included. Delivery scheduled based on availability. Delivers to the following counties only: Cuyahoga, Lorain, Medina, Summit, Geauga, Lake.